The circumstances of the current quagmire are these: For the last two and half to three years this administration has been covertly-waging an illegal war on Syria. Nothing about this secret-war was carried out under the U.S. Constitution or the International rule of the law which governs the behavior of nation-states between each other. The International Rules of War have been violated by the United States and its president. The current president, his vice-president, the leadership of the congress and the U.S. Supreme Court have all been active in prosecuting this multi-billion dollar illegal attack upon the sovereign nation of Syria. The depths to which this government has gone to deceive the world about both the viability of the government of Syria, as well as the intentions of The Syrian Government in dealing with their own people has all been built upon the deceptions and lies promulgated by the highest political offices in this country. In the last week the global-situation reached the point of threatening the entire world with World War III, based upon an entirely fictional account of a supposed gas-attack by Syria upon her own people. In fact it has been proven that the gas was not used by the government but was instead the work of the mercenaries which we paid to make it appear that Assad had killed his own people. Prior to this incident over 100,000 people have already died in this false and illegal war in Syria. The Obama administration used the CIA in tandem with Mossad to take the world to war over this supposed gas-attack that has a death toll that ranges from 500 to over a thousand people. “August 28, 2013 (Tony Cartalucci) - The Wall Street Journal has confirmed what many suspected, that the West's so-called "evidence" of the latest alleged "chemical attacks" in Syria, pinned on the Syrian government are fabrications spun up from the West's own dubious intelligence agencies. The Wall Street Journal reveals that the US is citing claims from Israel's Mossad intelligence agency fed to the Central Intelligence Agency (CIA), a repeat of the fabrications that led up to the Iraq War, the Libyan War, and have been used now for 3 years to justify continued support of extremists operating within and along Syria's borders. One crucial piece of the emerging case came from Israeli spy services, which provided the Central Intelligence Agency with intelligence from inside an elite special Syrian unit that oversees Mr. Assad's chemical weapons, Arab diplomats said. The intelligence, which the CIA was able to verify, showed that certain types of chemical weapons were moved in advance to the same Damascus suburbs where the attack allegedly took place a week ago, Arab diplomats said. As of this morning he was still saying both that he would make up his own mind and that he had not as yet made his decision. But with the clear NO vote against Cameron’s agreement with the bombing; the rest of the major nations began opposing Obama’s illegal-plans. By this afternoon the Wall Street Journal provided the death-knell for Obama’s lies, within his version of this story. Throughout these very nervous weeks the Russians, the Iranians and Syria began responding very strongly against the idea of this attack. Threatening their own counter-attacks against Israel and Saudi Arabia if Syria or Iran were attacked—by way of their own right to self-defense. 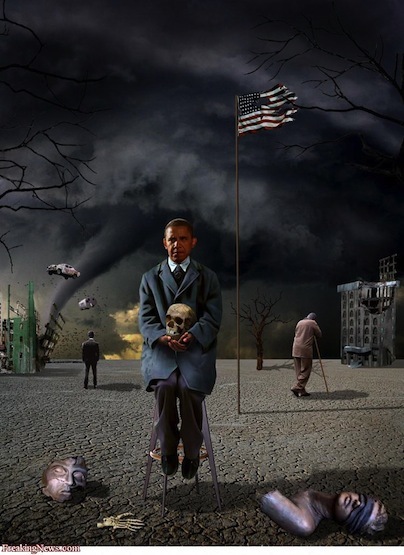 Thereafter nation after nation began to join this now global-rebellion, until by late today the only nation still not opposed to Obama’s criminal actions was France. This outright FAILURE of the U.S.A. to force our will upon the world clearly means that the U.S. has lost all credibility in the eyes of the community of nations. This is so because the script which Obama followed was the exact same plan that was used against Iraq in 2003. It failed then, and that led to the ultimate US losses in Iraq and Afghanistan which have cost us over $3 Trillion not counting the life-long health problems of millions of soldiers—the deaths of over three million Iraqi’s another 3 million displaced plus another 3 million hopelessly damaged by the war. Between the failure in Iraq, Afghanistan and the attack on Syria, there was also the needless slaughter of Libya that led the world ever deeper into the quicksand of barbarity. By this afternoon Italy, Germany, Turkey, China, Russia, Canada, Jordan and others in the EU had come down on the side of NOT joining Obama in this proposed crime that apparently he is still determined to commit in one way or another. Had Obama gotten away with this, the world would have added Syria to the global-list of devastated nations, with only more illegal wars to come, across the world. But since Obama has massively failed and been caught red-handed in falsifying the entire situation in Syria: His time in office is over. The only question is how will America deal with a blatant imposter and a war-criminal in the White House now? But this gets potentially much worse back in the real world where military events continue to ratchet up, despite whatever political movements might be failing. The Washington Post is reporting that Aleppo, Syria’s largest city has just dropped off the web. “While the U.S. government continues to weigh military intervention in Syria, it appears that Syria’s largest city has gone dark on the Internet. Aleppo, a city in Northern Syria that has been the site of intense fighting between rebel forces and the Assad regime, and the surrounding area appear to have lost connectivity to the Internet as of last night. The Switch received a tip informing us that Internet was out in parts of Northern Syria. Following up on that lead, we contacted Doug Madory of Internet intelligence company Renesys. In a recent blog post, Madory explained that outages in the Aleppo area are strongly correlated to disruptions in Turk Telekom’s service to the Syrian Telecommunications Establishment. When Turk Telekom service drops out of Syria, Aleppo appears to experience a “last mile” outage, but other areas continue to have Internet access through PCCW and Deutsche Telekom. Listening to Alex Jones………has several callers reporting on B52?s (stealth bombers) leaving bases, not coming back. One caller said he seen them leave the other day, did not come back. Also said he seen 5 of them leave again today………..has not returned. Thinks something big is about to happen. Thinks Obama is about ready to strike Syria, possibly Russia or other countries as well. This is serious. Kerry is on news saying they have proof (LIES) Syrians did it, and new attacks have just happened (CNN, more lies). Obama is about to give a speech in just minutes………….this again could be SERIOUS. He is NOT listening to Congress. He should be arrested, and all those scheming with him. I don’t have any links or articles as yet. Stay alert, stay safe, PREPARE! This is how things look tonight ­ August 30, 2013. We need to begin to think about how we can turn this around, deal with the imposter in the oval office, and keep his next war from beginning if we want a future anywhere ­ any time soon!